Preheat the oven to 350°F and spray a 9x9 baking dish with non-stick spray. Unroll the crescents and line the inside of the prepared baking dish, pinching all of the edges together and overlap if needed to form a solid layer of rolls. Set aside. Cook the ground beef in a large skillet over medium-high heat until browned; drain the fat. Add the taco seasoning mix and water. Cook until most of moisture has evaporated. Sprinkle 1 cup of taco chips on top of the rolls, then top with meat, then sour cream, then cheese. Bake for 20 minutes or until the crescents have browned and the sauce begins to bubble at the edges. Top with the remaining taco chips, and bake for 5 more minutes. Preheat oven to 450°F. Using a small sharp knife, cut off all peel and white pith from fruit. Working over a medium bowl, cut between membranes to release segments into the bowl. Squeeze the juices from the membranes into the bowl; discard membranes. Drain the fruit, reserving ½ cup of the fruit juices. Return the ½ cup of reserved juice to the bowl with the fruit. Season fillets with salt and pepper. Heat oil in a large skillet over high heat. Add the fish, and cook until golden brown and releases easily from pan, 6 to 8 minutes. Gently transfer the fish to a 9” x 13” pan, cooked side up. Bake until just opaque in the center, 5 to 10 minutes. 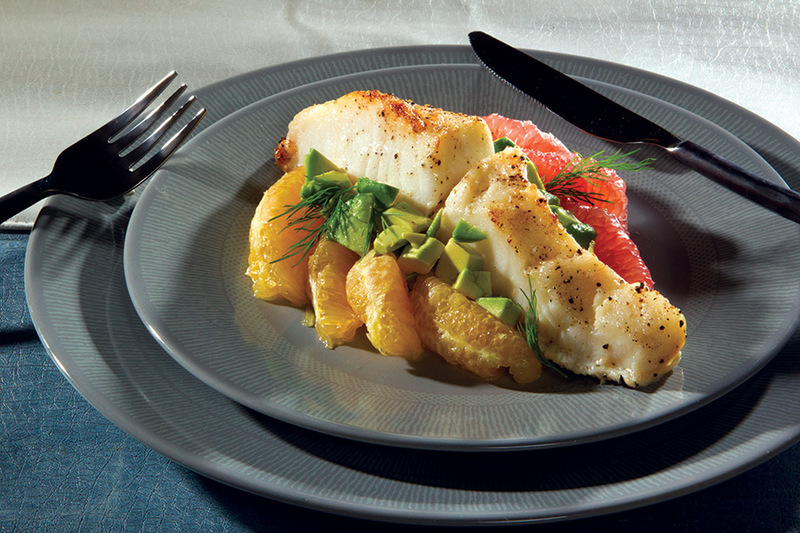 Divide the fruit and avocado between individual plates; top each with a sea bass fillet. Spoon 2 tbsp citrus juices and 1 tbsp avocado oil over the fish and fruit on each plate. In a large skillet, combine the carrots, water, cinnamon, and ginger. Mix well. Cover and cook on high for 6 minutes until almost tender. Add the maple syrup and butter. Mix well and continue to cook, uncovered, 2 to 3 minutes, until the carrots are well-glazed. Season, to taste, with sea salt, and serve warm. Place diced sweet potatoes in a bowl with olive oil and blackening spice, mix well. Place on a cookie sheet and cook for 20 minutes or until sweet potatoes are soft. Let cool. Heat a teaspoon of oil in a large sauté pan, add peppers, garlic, and shallots. Let sweat, then add the roasted sweet potatoes and bacon. Continue to cook until peppers are soft. Season scallops on both sides with salt and pepper. Heat 1 tablespoon oil in a nonstick skillet over high heat until just smoking. Add scallops in single layer, flat side down, and cook, without moving, until well browned, 1.5 to 2 minutes. Flip scallops and cook for another minute. 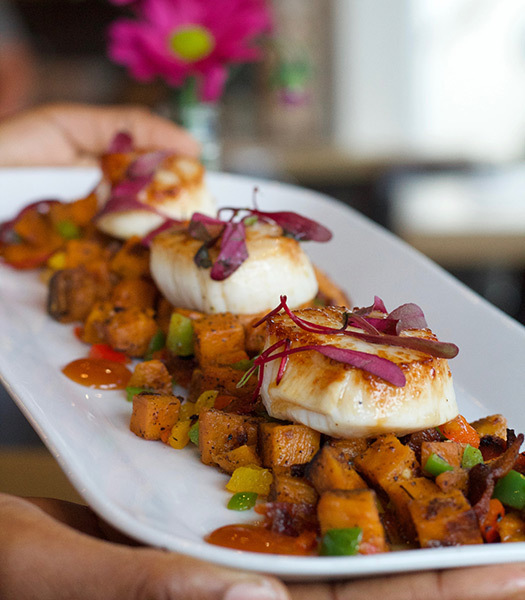 Serve scallops over sweet potato hash. Cut the frozen puff pastry dough into (4) 5”x5” squares. Beat the egg until smooth, adding water if necessary to thin out the egg wash. Using a pastry brush, gently brush each square with egg wash, and sprinkle with salt. Bake according to package directions until crisp and golden brown. Toss the vegetables with olive oil and season with salt and pepper. Roast at 375°F for 15 to 20 minutes, or until tender. In a large pot, heat the oil over medium-high heat. Whisk in the flour and stir until smooth, about a minute. Slowly whisk in the milk and cream until smooth. Bring to a boil and cook for about a minute, until thickened. Add the seasoning and whisk to thoroughly combine. Add the roasted vegetables and gently stir to coat them. Divide the mixture into four equal portions, top with puff pastry squares and serve. Heat oven to 350°F. In a shallow, 1-quart baking dish, combine all ingredients. Bake 20 minutes or until mixture is heated through. Stir and garnish with chopped green onions, if desired. Serve with tortilla chips, crackers, or vegetables. Sieve all of the dry ingredients together. Whisk the eggs and add the maple syrup. Blend the almond milk, dates, grated courgettes, and olive oil together. Melt the dark chocolate. Add the dry ingredients to egg mixture to create a smooth batter. Fold the almond milk mixture carefully into the batter and pour in the dark chocolate. Preheat the oven to 325°F, and pour the mixture into a lined tin. Bake for 15 to 20 minutes for cupcakes and 40 to 50 minutes for a cake. Blend everything except the dark chocolate in a food processor. Add the dark chocolate carefully while blending. Decorate as you please with raspberries, whipped topping, etc. Place the eggs, still in their shells, in a pan of cold salted water. Place over high heat and bring to a boil. Reduce heat to simmer for exactly nine minutes. Drain and cool the eggs under cold running water, then peel. Mix the sausage with the thyme, parsley, and spring onion in a bowl, and season well with salt and freshly ground black pepper. Divide the sausage mixture into four and flatten each out on a clean surface into a round flat patty. Place the seasoned flour onto a plate, then dredge each boiled egg in the flour. Place each egg onto a flat sausage patty, then wrap the sausage around each egg. Make sure the coating is smooth and completely covers each egg. Dip each sausage-coated egg into the beaten egg, rolling to coat completely. Then, dip and roll into the breadcrumbs to completely cover. Heat the oil in a skillet or deep heavy-bottomed pan, until a breadcrumb sizzles and turns brown when dropped into it. 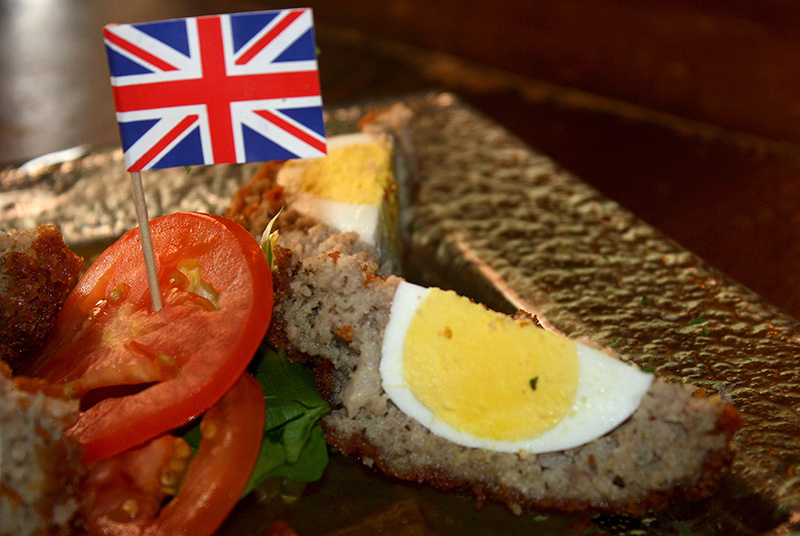 Carefully place each Scotch egg into the hot oil and deep fry for 8 to 10 minutes, until golden and crisp and the sausage is completely cooked. Carefully remove from the oil with a slotted spoon and drain on kitchen paper. Serve warm or cool. Combine all ingredients together in cocktail shaker. Double strain and serve in Coupe glass. Garnish with mint leaf or sprig. Combine all ingredients. Shake well and strain over ice. Serve with cucumber strip garnish and beautiful mint sprig. Place the blanched chopped spinach, Parmesan cheese, roasted garlic purée, red pepper flakes, cream cheese, and goat cheese in a large bowl. Combine with a mixer until smooth and place into a piping bag. In a small mixing bowl, combine the panko bread crumbs, Parmesan cheese and herbs. Pipe the mushrooms with the mix and top with the breadcrumb mixture. Bake at 350oF for 22 minutes and serve. Add one strawberry and ¼ oz. vanilla simple syrup to shaker tin and muddle. Fill shaker tin with ice, and add 1.5 oz. vanilla-infused tequila, ½ oz. triple sec, 1 oz. kiwi simple syrup, 1 oz. fresh sour mix, and a splash of ginger beer. Shake well. Strain into ice-filled, sugar-rimmed glass and garnish with sugar-encrusted kiwi. For the beef, heat an outdoor grill to highest heat, and preheat oven to 375°F. Season the steaks generously all around with salt and pepper. Use a generous amount of salt as this is a thick steak. Grill for 3 to 4 minutes on each side, letting the flames lick up the sides. Transfer the steak to a baking sheet and bake until the steak reaches an internal temperature 130°F for a perfect medium rare. Let rest for 5 to 10 minutes before slicing. Slice the fennel into ½” thick pices and leave the radishes and carrots whole. Mix the olive oil, honey, chopped thyme, toasted coriander seeds, and chopped garlic. In a large mixing bowl, toss all of the vegetables separately with the oil mixture and lay out on sheet pan trays with parchment paper. Roast the carrots at 425°F for 15 minutes, roast the radishes at 425°F for 5 minutes, and the radishes at 450°F for 5 minutes. Cut the serrano chili in half and remove the seeds, then slice the pepper thin. Zest and juice the lemons, then toast the pumpkin seeds at 375°F for 5 minutes. Combine all of the roasted vegetables, pumpkin seeds, chili pepper, and vinegar prior to serving. Preheat oven to 350°F. Spray a 9”x13” baking dish with non-stick cooking spray. Heat a non-stick skillet over medium-high heat until hot. Add the sausage to the skillet and cook, stirring occasionally, until browned; drain and set aside. Place the potato rounds in the prepared baking dish. Arrange the cooked sausage evenly over the potatoes. Beat the eggs with the milk in a medium bowl or a 1-quart glass measure. Pour egg mixture over potatoes and sausage. Sprinkle cheese over eggs. Crumble bacon over cheese. Cover with foil and bake for 40 minutes or until eggs are set and the dish has cooked through. Uncover and bake an additional 10 minutes. Prepare basmati rice according to package directions and set aside. Heat a sauté pan with 2 teaspoons extra virgin olive oil. Add the raw chicken and heat for several minutes. Add the vegetables and curry; cook until tender. Add the butter, chicken stock, salt, and pepper to taste. Heat until melted. Serve over rice and garnish with green onions.